In a cinematic year defined by two powerhouse battles between famous characters and some other great superhero movies comes Doctor Strange, the sixth major comic book film of 2016, but thankfully, one of the most unique to date. This follows Captain America: Civil War as yes, the fourteenth installment in the massive Marvel Cinematic Universe that has three more movies planned for next year alone. Benedict Cumberbatch (coolest name in Hollywood) stars as the titular wizard alongside a solid supporting cast that includes Chiwetel Ejiofor, Rachel McAdams, Mads Mikkelsen and Tilda Swinton, amongst others. With trailers that gave me the feeling of Inception meets Marvel, I was pretty excited to see what we would get from this fresh, new movie. 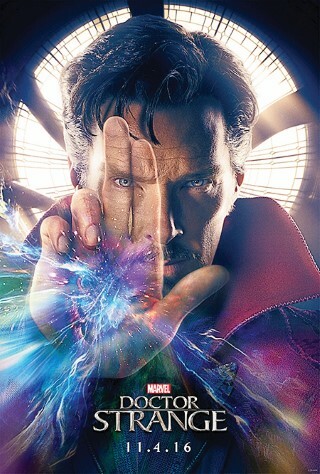 Doctor Stephen Strange (Cumberbatch) is a genius neurosurgeon with a bit of an arrogant edge to him. One night, he gets in a brutal car accident, losing so many nerves that he can no longer use his hands. This makes him ultimately useless for his own work, and Strange becomes very frustrated because of it. His relentless search for a seemingly impossible cure eventually leads him to Kamar-Taj, a temple of sorts in Nepal. There, he meets Mordo (Ejiofor) and The Ancient One (Swinton) as his hopeful healing journey soon leads him into a world of mystical arts. Strange eventually finds himself protecting our real world from the threats of whatever lies beyond through the use of his newly learned abilities. As confusing as that plot may sound, I thought that these alternate universes were explained perfectly over the course of the film, in a way that reminded me of the 1999 masterpiece, The Matrix. Similarly to that science-fiction classic and even more recently with Christopher Nolan’s Inception, Doctor Strange has some truly genre-altering visual effects work that will most likely change the way that science fiction films are made moving forward. That being said, I think this is the most visually impressive out of all the movies in the Marvel Cinematic Universe to date. It also has an origin story that I think is just as good as Batman Begins, largely due to an excellent lead performance from Benedict Cumberbatch. All of these things combined make me say that I enjoyed this movie even more than Civil War, making Doctor Strange my favorite Marvel chapter to date and as of right now, the best film of 2016 for me.